NEW!! single spear for euro style quick attach. The BS10 & BS20 Series Bale Spears can be attached to machines fitted with a Skid Steer adapter mounting plate, while the BSE10 and BSE20 Series Bale Spears can be attached to machines fitted with a Euro style adapter mounting plate. Bales can be pushed onto side dump trailers with single and double spear units. Single spear units take less force to push the spear into the bale and bales of all sizes won't shift positions as easily while pushing the spear into the bale. Double spear units have twice the lifting capacity. The two spears spaced apart also miss the soft inner core of a bale and probe the harder outer area allowing the spears to lift a heavier bale. Designed to fit Skid Steer Loader hitches or Euro style hitches: The BS Series can be attached to machines fitted with a Skid Steer adapter mounting plate and the BSE Series can be attached to machines fitted with a Euro style adapter mounting plate. Spear units punch holes in end of bale not in the circumference: Very little moisture can enter the bale where spears punch. Grappling type bale lifts punch holes in the circumference allowing moisture to penetrate the bale and accelerates bale deterioration. Single spear units takes less force to push the spear into the bale: Bales of all sizes won’t shift positions as easily while pushing the spear into the bale. Single spears are ideal for lifting smaller lighter bales. Double spear units can lift heavier bales: Two spears spaced apart miss the soft inner core of a bale and probe the harder outer area allowing the spears to lift a heavier bale. Also, two spears do a better job of stabilizing the load. Double spear units probe lower on the bale: They can lift the bale higher. Weight of Unit: 168 lb. 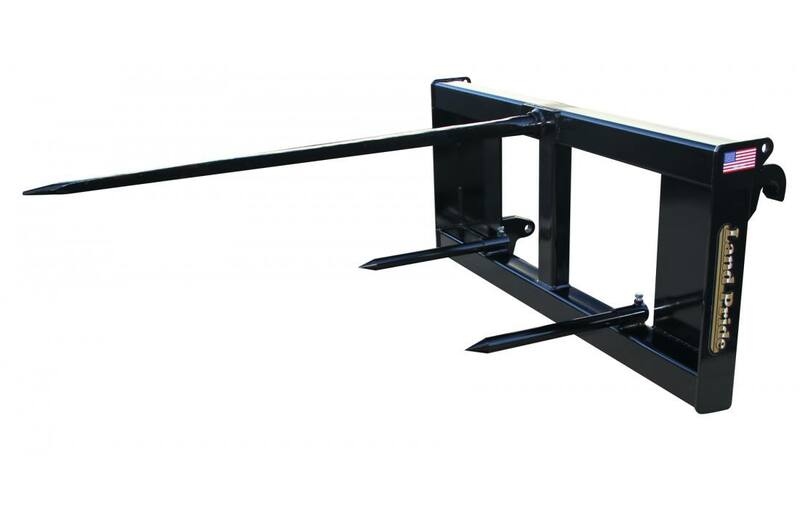 Frame Lift Capacity 24" from face of frame: 1,800 lb. Spear Probe Length Face of Frame to End of Point: 44 1/2 in.